INFRASTRUCTURE: Facilities offer jobs nationally, in large cities and rural areas alike. Both the public and private sector have a shared responsibility to oversee infrastructure systems. Infrastructure can also represent a key economic anchor. Infrastructure facilities offer accessible, durable career growth in every community across the country. As our recent report on the U.S. water infrastructure workforce shows, water utilities embody these anchor-like roles. They act as a key hubs for jobs, training, and environmental stewardship at a local and regional level. On the lookout for a new generation of workers to construct, operate, and maintain pipes, plants, and numerous other water systems, utilities offer long-term, well-paid positions for workers across all skill levels. And the fact that they do so in some of the most disadvantaged areas nationally speaks to their unique role in expanding economic opportunity in their backyard. At a time when utilities are looking to drive additional infrastructure improvements and hire more workers, there are many potential candidates looking for work who could fill these positions, essentially waiting at the door. Looking at the locations of the country’s publicly owned water treatment plants—alongside the characteristics of the neighboring populations served—sheds more light on this dynamic. By analyzing spatial data from the Environmental Protection Agency’s Facility Registry Service and the American Community Survey, it is possible to see how demographics, educational attainment, unemployment, and poverty rates vary in tracts with water treatment plants. Although these characteristics can differ markedly from place to place, one takeaway becomes clear: Many utilities concentrate operations in areas where residents experience higher unemployment and higher poverty. As just one example, consider Louisville, Kentucky, which is aiming to improve its water infrastructure and connect local residents with careers in this space. Overseen by the Louisville and Jefferson County Metropolitan Sewer District (MSD), the Morris Forman Water Quality Treatment Center is the state’s largest water treatment plant, squarely located in an area where residents face significant economic shortfalls. In 2016, the unemployment rate stood at almost 10 percent for nearby workers, and the poverty rate stood at 29 percent—more than double the 4.5 percent unemployment rate and 14 percent poverty rate seen nationally. Furthermore, 54 percent of nearby workers only had a high school diploma or less, compared to 32.5 percent of all workers nationally. 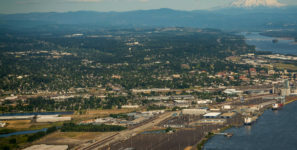 Every local infrastructure anchor needs a skilled workforce to construct, design, and oversee a variety of facilities in years to come, which ideally could connect to a local pool of labor: transit agencies in need of operators, energy utilities in need of technicians, and ports in need of warehousing and logistics workers. While many of these positions are concentrated in the skilled trades, several others are involved in technical and administrative support, speaking to the breadth of opportunities available to workers, who have millions of shoes to fill in an aging workforce eligible for retirement. In the biggest markets like Los Angeles, for instance, infrastructure represents a key anchor in many ways. Large facilities like the Hyperion Water Reclamation Plant not only provide an essential service for the region, but also serve as a magnet for jobs. Los Angeles International Airport and the Port of Los Angeles are perhaps two of the region’s most significant anchors, driving a variety of economic activities, employing thousands of workers, and powering future growth—in close proximity to areas where poverty remains a thorny challenge. Of course, that does not mean it is always to easy hire, train, and retain workers for these jobs, let alone for long-term careers. A lack of visibility and interest in career and technical education has eroded the pipeline of workers entering the infrastructure space, and even when these candidates gain needed skills and competencies, they can struggle to navigate an inflexible, time-consuming hiring process. The demand for on-the-job training and applied work experience can also act as a barrier to entry, especially for younger and other nontraditional jobseekers—including disconnected youth, the out-of-work, and individuals with a criminal past—who may struggle to find (or qualify for) internships and entry-level positions. Finally, the lack of portable credentials and certifications may limit the mobility of existing workers to fill positions across different regions. These and other related challenges, though, should prompt local leaders to re-energize and refocus their infrastructure workforce development efforts, ideally in closer collaboration with the major infrastructure employers in their markets. Introducing students and other prospective workers to infrastructure careers earlier and more often would help—through internships and local demonstration projects, for instance—as would creating more flexible training programs and ongoing learning opportunities for workers looking to gain more experience. Traditionally, many infrastructure employers have shied away from the spotlight, opting to carry out their operations discreetly and avoiding any unneeded attention from regulators and other public officials. But the time is ripe for these employers to actively partner with local political leadership, workforce organizations, educational institutions, labor groups, and other actors to heighten their central economic role and ultimately stretch their economic reach. Joseph Kane is senior research associate and associate fellow at Brookings’ Metropolitan Policy Program. This article originally appeared here.